Want to show multiple galleries all in one album? With our Albums Addon for Envira Gallery, you can! This tutorial will walk you through how to use the Albums Addon with step-by-step instructions. How do I change the gallery cover image? Can I open the gallery in lightbox view directly? I have more galleries than I see when editing my Album, why can’t I see all my galleries? I’ve enabled the ‘Display Back to Album Link’ option, why isn’t it showing? Can I have the galleries open in a new window instead of the lightbox or the same page? Why are my album pages only showing the gallery description, and not my gallery titles and image count? Why are my featured content images not showing in my album? Can the gallery title link as well as the gallery cover image? Why can’t I use Woocommerce Addon with Albums? In this instance, you’ll be activating the Envira Albums Addon. Once you’ve installed your Albums Addon, you’ll see a message asking you to enable the Standalone feature for Envira. The Envira Albums Addon requires that Envira Standalone is enabled. 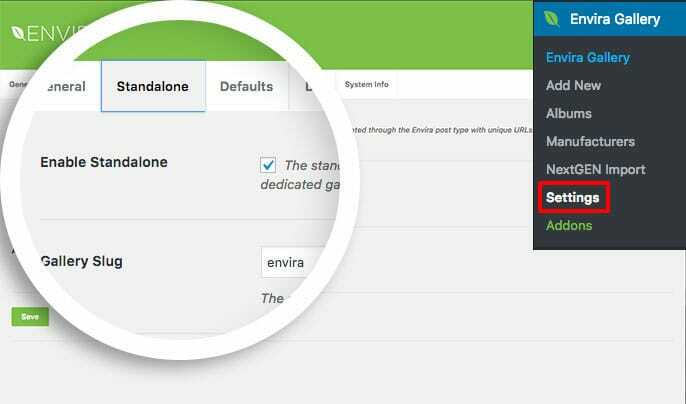 Please enable Standalone from the Envira Settings page. To enable this, navigate to Envira Gallery » Settings » Standalone tab and check the box for Enable Standalone. Then click Save to save the changes. When using and changing slug name in WordPress, it’s no uncommon to get 404 messages so if you see this on your site, just go to your WordPress Admin » Settings » Permalinks and click Save to re-save the permalinks to flush out the rewrite rules in WordPress. 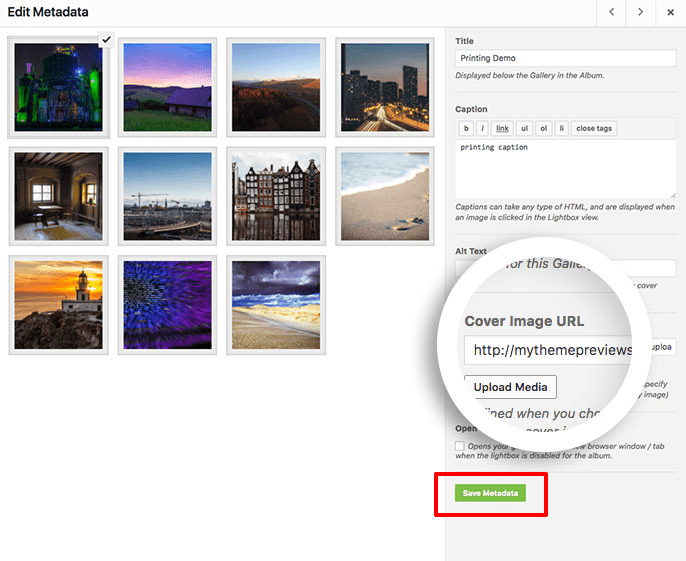 Your next step is to navigate to the WordPress Admin » Envira Gallery » Albums screen. Then select the Add New button to create a new album. On the next screen, you will notice the process for creating an album is nearly identical to creating a gallery. Give your album a title. For best practices, it’s best to use a unique name that hasn’t been used for any other galleries, posts or pages. Next, it’s time to add some galleries to your album from the Galleries tab. Simply drag and drop the galleries into the space provided. IMPORTANT: Only Published and non-private galleries are available to add to your album. If you’re not able to locate a gallery you want to add to your album, confirm that you’ve Published the gallery first. 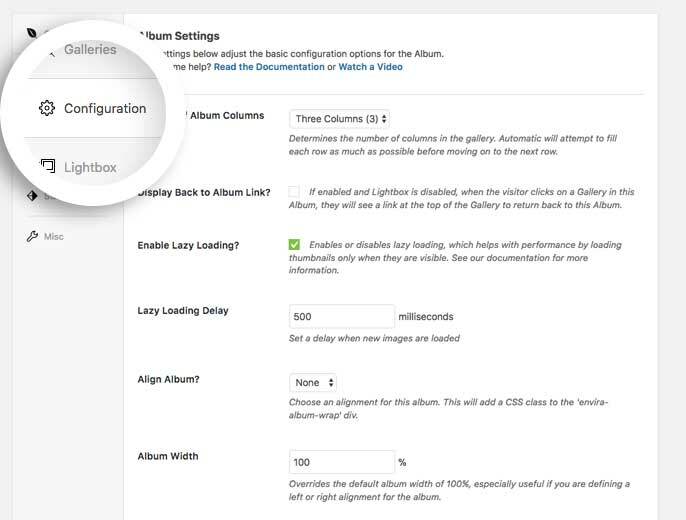 Once you’ve added a gallery or two to your album, it’s now time to configure your album. On the Configuration tab you’ll see a list of available options that are very similar to what you see with galleries with only a few exceptions. All available options will show the name of the option and a brief description of the purpose they serve. If at any time you have any questions about any of these options, feel free to reach out to support and we would be happy to assist! For each gallery inside the album, only 1 image will show to represent that gallery. This is called a gallery cover image. Now it’s time to set up any specific mobile options for your album. Click on the Mobile tab and enable any specific mobile options for your Envira album. 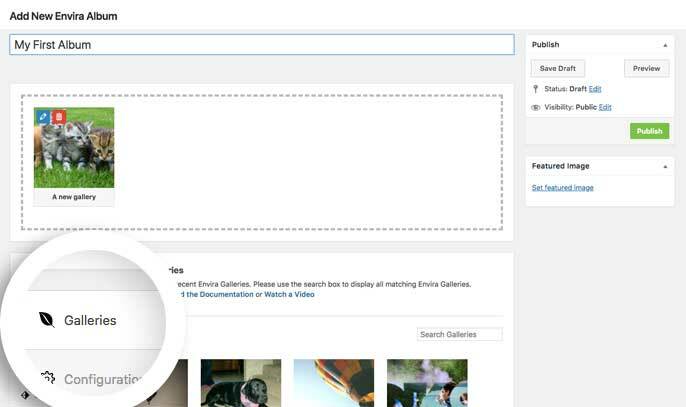 Finally, simply click Publish on your album and then view it on the front-end of your site to see the results. 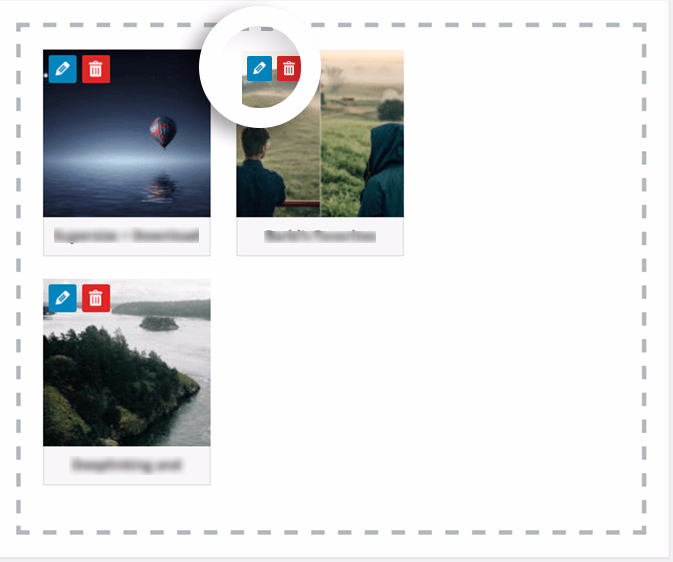 You can add or embed an album on a page in the same way that you added or embedded a gallery on a page. Just click the Add Album button from any post or page. Check out some of our album demos we’ve created for a sample view of the powerful Envira Albums Addon. Now that you’ve created your first album, check out our tutorial on How To Add Image Counter to Album Lightbox. Q: How do I change the gallery cover image? A: Select the pencil icon on the top of the gallery thumbnail image to select a specific cover image, edit the cover image, and save the metadata. With the Envira Albums 1.6.0, you can now upload or select a cover image and the image doesn’t have to be included in the gallery. To do this, just edit your album. Then click the blue pencil icon to edit the gallery and upload a new cover image or select one from your media library. Remember to click Save Metadata when making any changes to this screen so that your changes will be saved. Q: Can I open the gallery in lightbox view directly? A: Yes! You can do this by enabling the Lightbox option under the Lightbox tab when editing your Album. Q: I have more galleries than I see when editing my album, why can’t I see all my galleries? A: To improve the performance of the edit screen not all available galleries are shown by default. 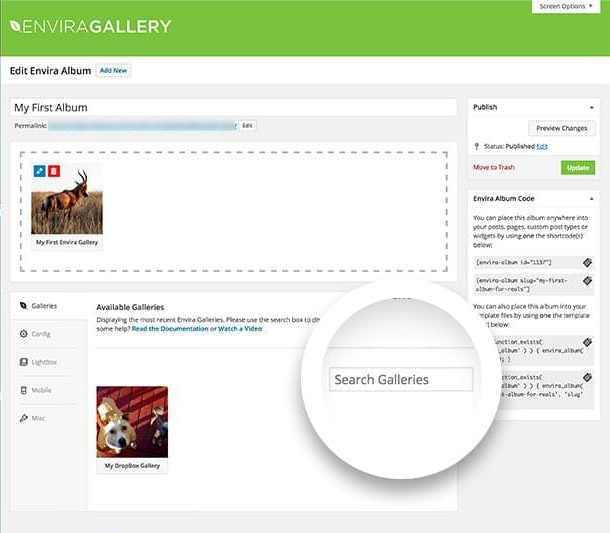 You can use the Search box to locate specific galleries you want to add to your Album. Q: I’ve enabled the Display Back to Album Link option, why isn’t it showing? A: Check that you’re viewing the album through it’s Standalone URL. This link will not appear if you’re viewing the album embedded in a page or post. Q: Can I have the galleries open in a new window instead of the lightbox or the same page? A pop up window will appear. Simply enable the Open URL in New Window? by selecting the box beside this option. 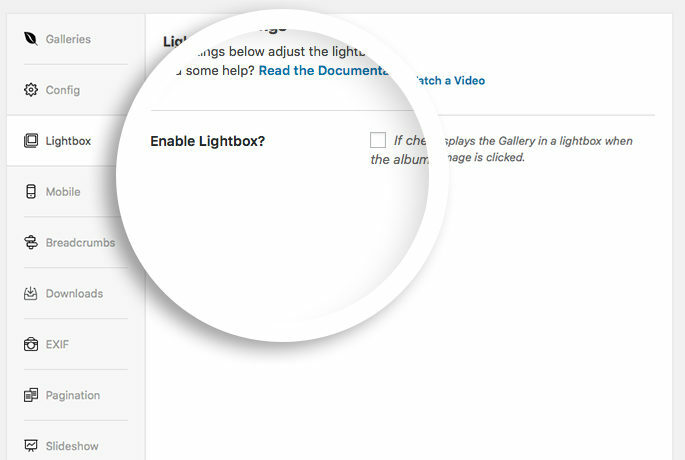 This option will only be considered when the Enable Lightbox checkbox from the Lightbox Tab in the first step is disabled for the album. Q: Why are my album pages only showing the gallery description, and not my gallery titles and image count? 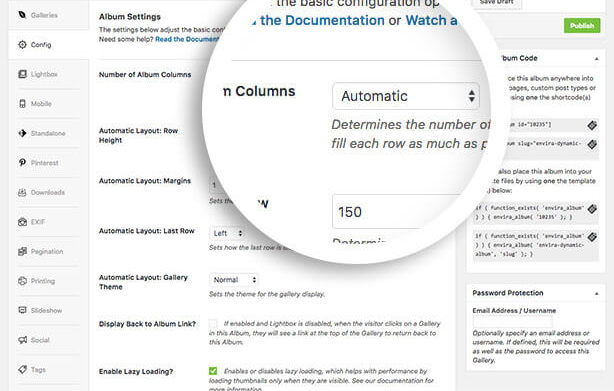 A: Check if you have the Number of Album Columns set to Automatic in the dropdown from the Configuration tab. If you are displaying the gallery descriptions, when using the Automatic Justified Layout for albums with the Display Gallery Descriptions? enabled, this will override all other settings to show the gallery caption, the gallery title or the gallery count. Q: Why are my featured content images not showing in my album? A: Due to the way that the Featured Content Addon allows images to be pulled into a gallery, Featured Content galleries are not compatible with the Albums Addon and will not display any images. Q: Can the gallery title link as well as the gallery cover image? A: Absolutely! Just edit the gallery inside the album by clicking the blue pencil icon and check the box to Make Gallery Title Linkable? and then click the green Save Metadata button to save the changes. 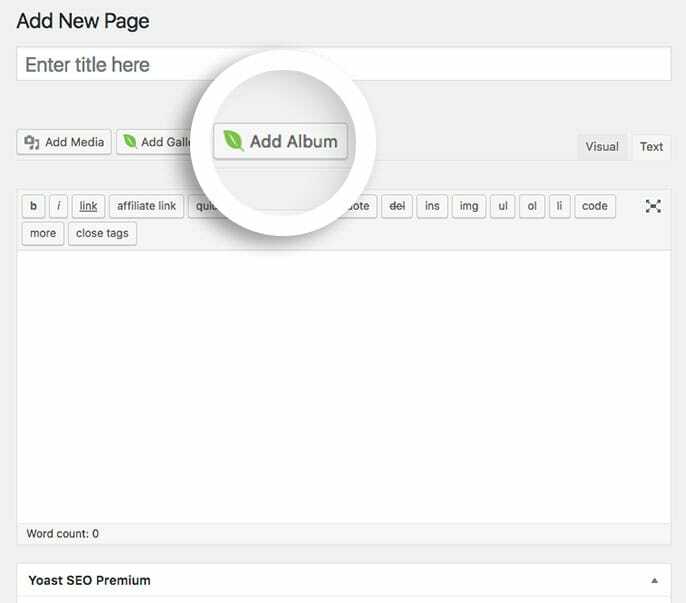 Q: Why can’t I use Woocommerce Addon with Albums? A: Unfortunately at this time Woocommerce Addon and the Albums Addon won’t work together. To add Woocommerce galleries to your album, just uncheck the Enable Lightbox? on the album so that when a user clicks the gallery cover image, they’ll be redirected to the gallery’s standalone tab. Fix: Issue with automatic layout and showing total images. Fix: Conflict with lightbox and CSS addon resolved. Fix: Various minor bug fixes. Fix: Dynamic albums and random sorting issues resolved. Fix: Issue with cover album image and/or settings reset in some setups resolved. Fix: Gallery titles show on hover with automatic layout. Fix: Improved support for standalone albums using unique album slugs. 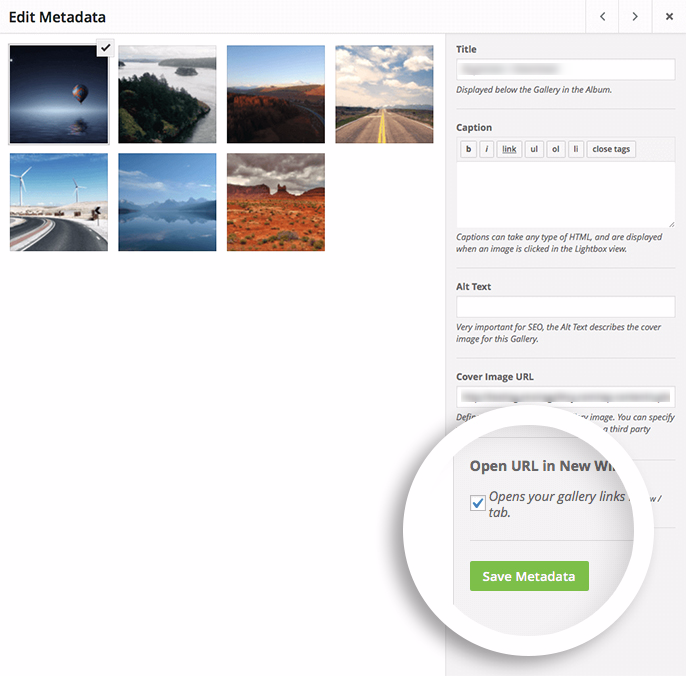 Enhancement: New "Make Gallery Titles Linkable" option for galleries. Fix: Better showing of album covers in latest Chrome browser. Fix: Tweaked admin UI and CSS on mobile and narrow width devices. Enhancement: Added support for featured images. Added: Filter for lightbox "idle time". Fix: Improvements in lighbox displays, including thumbnails, in certain scenarios. Fix: Fullscreen on open works with Fullscreen Addon. Fixed: Jetpack conflict with Image Count. Fix: Title toolbar showing html characters. Added: Album CPT page now supports authors. Fix: Add Album button for RTL displays. Fix: PHP errors with Featured Content addon resolved. Fix: CSS reset when using WYSIWYG. Fix: Gallery Titles not displaying. Fix: Automatic layout displays titles. Fix: UI for galleries without titles. Fix : Admin search submitting form. PHP optimizations to improve performance. Fix: Invalid path to gallery themes stylesheets. Fix: Galleries displaying in album even if they had been deleted or trashed. 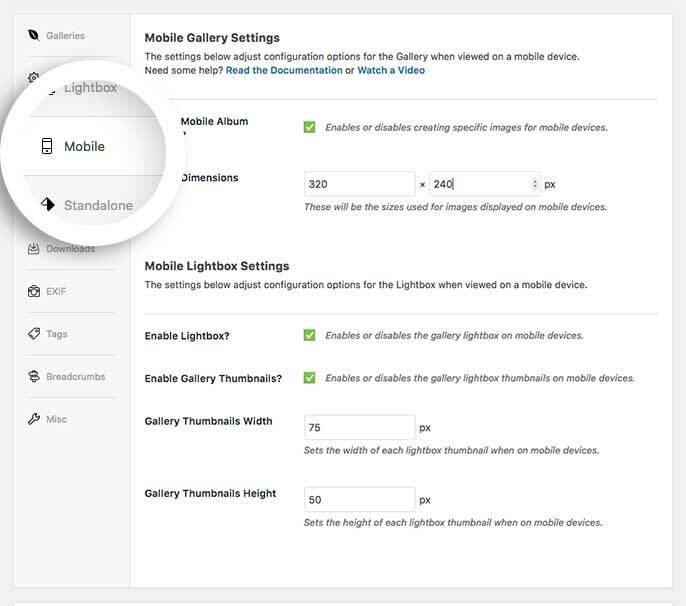 Updated: Description for displaying gallery title in settings. Added: Galleries now have the option to open in new browser windows. Fix: Showing visiblity for galleries in edit screen. Fix: Dynamic Album shortcode was not working in certain circumstances, now improved. Fix: Lightbox toolbar and thumbnail layout fixes. Fix: Ensure that the same transition effects that exist in galleries can be set / applied to albums. Added: Mobile: Option to define number of album columns. Fix: Warning when outputting a dynamic Album. Fix: Removed PHP warning if an Album contains Featured Content or Instagram galleries but their respective Addons are disabled. Fix: Mobile Dimensions duplicated on Config and Mobile tabs; dimensions are not just on the Mobile tab. Added: Featured Content Galleries can be searches and added to an Album. Added: Featured Content Galleries can appear in an Albums lightbox view. Added: Instagram Galleries can be searches and added to an Album. Added: Instagram Galleries can appear in an Albums lightbox view. Fix: Typo in edit_others_envira_albums capability, preventing some Administrators editing Albums belonging to lesser roles. Fix: Added in all required capabilities; removed map_meta_cap. Added: Custom Capabilities for Albums (publish_envira_album, delete_envira_album etc). Fix: Prevent double cropping of album cover images; removed cover image URL field until better implementation can be provided. Fix: Call to undefined function load_gallery_theme(). 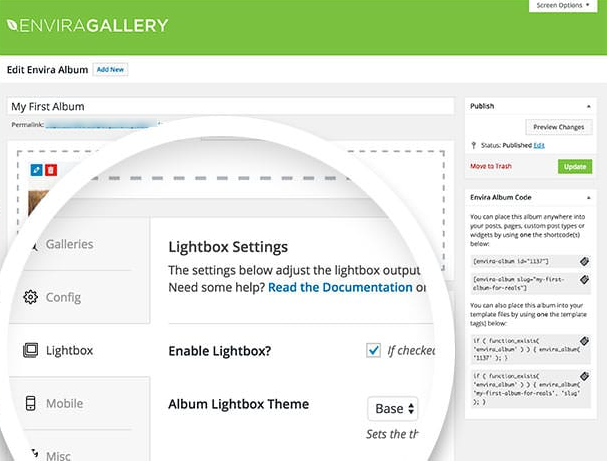 Added: Lightbox - Gallery Lightbox Theme, Arrow Position, Title in Toolbar, Toolbar Position and HTML5 Output options to match Gallery Lightbox settings. Added: data- attributes to Lightbox image, per Gallery. 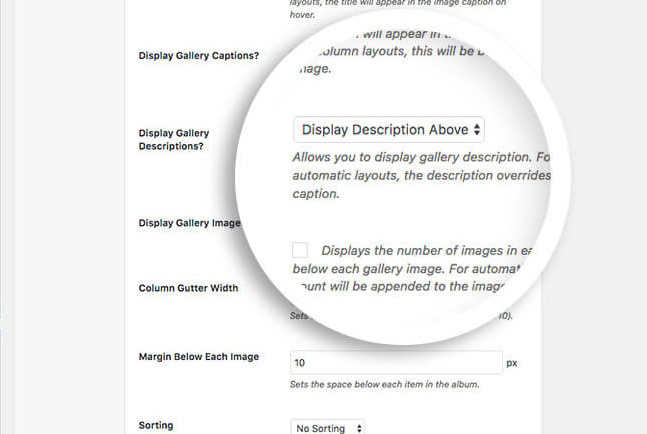 Added: Option to display gallery title in Lightbox Toolbar. Fix: Undefined index errors when WP_DEBUG enabled on saving Album. Added: Galleries in albums can be opened directly into the lightbox. Fix: Deleting albums causing PHP notice. Fix: Drag and drop area not expanding as new galleries are added. Fixed fatal error with albums widget.